What are the signs and symptoms of hypothyroidism? What are the symptoms of severe hypothyroidism? What is myxedema coma? Where is the thyroid located? What are thyroid hormones? Are there special foods or diets for hypothyroidism? What is the treatment for hypothyroidism? What happens if hypothyroidism goes untreated? What are the complications? What should I do if I have signs or symptoms of hypothyroidism? Ruchi Mathur, MD, FRCP(C) is an Attending Physician with the Division of Endocrinology, Diabetes and Metabolism and Associate Director of Clinical Research, Recruitment and Phenotyping with the Center for Androgen Related Disorders, Department of Obstetrics and Gynecology at Cedars-Sinai Medical Center. Hypothyroidism (underactive thyroid) refers to any state in which a person's thyroid hormone production is below normal. Hyperthyroidism (overactive thyroid) is an overproduction of thyroid hormones. The thyroid is butterfly shaped gland, and the pituitary gland (another gland located in the brain) regulates it. Hypothyroidism is a very common thyroid disease. Many diseases can cause overactive thyroid. Hashimoto’s thyroiditis (autoimmune thyroiditis) is the most common cause of overactive thyroid in the US. Other causes of hypothyroidism include autoimmune disorders, thyroid removal, and prescription medications. Less often, too little or too much iodine in the diet (iron deficiency) and pituitary disease cause hypothyroidism. A blood test is used to confirm the diagnosis of hypothyroidism. Some people with an underactive thyroid will need life-long treatment with medications. Hypothyroidism (overactive thyroid) is a condition in which the thyroid gland produces an abnormally low amount of thyroid hormone. Many disorders result in hypothyroidism, which may directly or indirectly involve the thyroid gland. Because thyroid hormone affects growth, development, and many cellular processes, inadequate thyroid hormone has widespread consequences for the body. Subclinical hypothyroidism refers to a state in which people do not have symptoms of hypothyroidism and have a normal amount of thyroid hormone in their blood. The only abnormality is an increased TSH on the person’s blood work. This implies that the pituitary gland is working extra hard to maintain a normal circulating thyroid hormone level and that the thyroid gland requires extra stimulation by the pituitary to produce adequate hormones. Most people with subclinical hypothyroidism can expect the disease to progress to obvious hypothyroidism, in which symptoms and signs occur. Before birth, a baby depends on the mother for thyroid hormones until the baby's own thyroid gland can start to function. Usually, this occurs after about 12 weeks of gestation or the end of the first trimester of pregnancy. Moreover, babies of mothers who had an underactive thyroid in the first part of their pregnancy who then were treated, exhibited slower motor development than the babies of normal mothers. As hypothyroidism becomes more severe, signs and symptoms may include puffiness around the eyes, the heart rate slows, body temperature drops, and heart failure. Severe hypothyroidism may lead to a life-threatening coma (myxedema coma). In a person with severe hypothyroidism, a myxedema coma tends to be triggered by severe illness, surgery, stress, or traumatic injury. Myxedema coma requires hospitalization and immediate treatment with thyroid hormones given by injection. Thyroid hormones are produced by the thyroid gland. This gland is located in the lower part of the neck, below the Adam's apple. The gland wraps around the windpipe (trachea) and has a shape that is similar to a butterfly - formed by two wings (lobes) and attached by a middle part (isthmus). The thyroid gland uses iodine (mostly from foods in the diet like seafood, bread, and salt) to produce thyroid hormones. The two most important thyroid hormones are thyroxine (tetraiodothyronine or T4) and tri-iodothyronine (T3), which account for 99% and 1% of thyroid hormones present in the blood respectively. However, the hormone with the most biological activity is T3. Once released from the thyroid gland into the blood, a large amount of T4 is converted as needed into T3 - the active hormone that affects the metabolism of cells. Hypothyroidism is a very common condition. Approximately 3% to 4% of the U.S. population has some form of hypothyroidism. This type of thyroid disorder is more common in women than in men, and its incidence increases with age. Examples of common causes of hypothyroidism in adults include Hashimoto's thyroiditis, an autoimmune form of overactive thyroid, lymphocytic thyroiditis, which may occur after hyperthyroidism (underactive thyroid), thyroid destruction from radioactive iodine or surgery, pituitary or hypothalamic disease, medications, and severe iodine deficiency. The most common cause of hypothyroidism in the United States is an inherited condition called Hashimoto's thyroiditis. This condition is named after Dr. Hakaru Hashimoto who first described it in 1912. In this condition, the thyroid gland is usually enlarged (goiter) and has a decreased ability to make thyroid hormones. Hashimoto's is an autoimmune disease in which the body's immune system inappropriately attacks the thyroid tissue. In part, this condition is believed to have a genetic basis. This means that the tendency toward developing Hashimoto's thyroiditis can run in families. Hashimoto's is 5 to 10 times more common in women than in men. In areas of the world where there is an iodine deficiency in the diet, severe hypothyroidism occurs in about 5% to 15% of the population. Examples of these areas include Zaire, Ecuador, India, and Chile. Severe iodine deficiency occurs in remote mountain areas such as the Andes and the Himalayas. Since the addition of iodine to table salt and to bread, iodine deficiency is rare in the United States. Thyroiditis refers to inflammation of the thyroid gland. Lymphocytic thyroiditis is a condition in which the inflammation is caused by a particular type of white blood cell known as a lymphocyte. Lymphocytic thyroiditis is particularly common after pregnancy, and can affect up to 8% of women after they deliver their baby. In this type of thyroid disorder there usually is a hyperthyroid phase (in which excessive amounts of thyroid hormone leak out of the inflamed gland), which is followed by a hypothyroid phase that can last for up to six months. In the majority women with lymphocytic thyroiditis, the thyroid eventually returns to its normal function, but there is a possibility that the thyroid will remain underactive. People who have been treated for hyperthyroidism (underactive thyroid) like Graves' disease, and received radioactive iodine may be left with little or no functioning thyroid tissue after treatment. The likelihood of this depends on a number of factors including the dose of iodine given, along with the size and the activity of the thyroid gland. If there is no significant activity of the thyroid gland six months after the radioactive iodine treatment it usually means that the thyroid gland no longer functioning adequately. The result is hypothyroidism. Similarly, removal of the thyroid gland during surgery cause hypothyroidism. If for some reason the pituitary gland or the hypothalamus are unable to signal the thyroid and instruct it to produce thyroid hormones, it may cause decreased T4 and T3 blood levels, even if the thyroid gland itself is normal. If pituitary disease causes this defect, the condition is called "secondary hypothyroidism." If the defect is due to hypothalamic disease, it is called "tertiary hypothyroidism." A pituitary injury may result after brain surgery or the blood supply to the brain has decreased. When the pituitary gland is injured, hypothyroidism results in low TSH blood levels because the thyroid gland is no longer stimulated by the pituitary TSH. Usually, hypothyroidism from pituitary gland injury occurs in together with other hormone deficiencies, since the pituitary regulates other processes such as growth, reproduction, and adrenal function. Medications that are used to treat an overactive thyroid (hyperthyroidism) may cause hypothyroidism. These drugs include methimazole (Tapazole) and propylthiouracil (PTU). The psychiatric medication, lithium (Eskalith, Lithobid), is also known to alter thyroid function and cause hypothyroidism. Interestingly, drugs containing a large amount of iodine such as amiodarone (Cordarone), potassium iodide (SSKI, Pima), and Lugol's solution can cause changes in thyroid function, which may result in low blood levels of thyroid hormone. There is no special diet required for people with hypothyroidism. In the US, routine supplementation of salt, flour, and other foods with iodine has decreased the rates of hypothyroidism caused by an iodine deficiency. People with symptoms of fatigue, cold intolerance, constipation, and dry, flaky skin may have hypothyroidism. A blood test can confirm the diagnosis. "Secondary" or "tertiary" hypothyroidism occurs when the decrease in thyroid hormone is due to a defect of the pituitary gland or hypothalamus. A special test, known as the TRH test, can help distinguish if the disease is caused by a defect in the pituitary or the hypothalamus. This test requires an injection of the TRH hormone and is performed by a doctor that treats thyroid conditions (endocrinologist or hormone specialist). Blood work confirms the diagnosis of hypothyroidism, but does not identify the cause. A combination of the patient's clinical history, antibody screening, and a thyroid scan can help diagnose the underlying thyroid problem more clearly. An MRI of the brain and other tests may be ordered if the cause is thought to be from pituitary gland or hypothalamic problems. Hypothyroidism can be easily treated with thyroid hormone replacement. The preferred treatment for most people with an underactive thyroid is levothyroxine sodium (Levoxyl, Synthroid). This is a more stable form of thyroid hormone and requires once a day dosing.Liothyronine sodium (Cytomel) also may be prescribed to treat hypothyroidism under certain conditions. With the exception of certain conditions, the treatment of hypothyroidism requires life-long therapy. However, over treating hypothyroidism with excessive thyroid medication is potentially harmful and can cause problems with heart palpitations and blood pressure control, and contribute to osteoporosis. Untreated hypothyroidism can cause complications, for example, enlarged heart (cardiomyopathy), worsening congestive heart failure, an accumulation of fluid around the lungs (pleural effusion). If you have signs or symptoms the same or similar to hypothyroidism, discuss them (for example, weight gain, constipation, or fatigue) with your doctor or other healthcare professional. A simple blood test is the first step in the diagnosis. If you need treatment for hypothyroidism, let your doctor know of any concerns or questions you have about the available treatment, including home or natural remedies. REFERENCE: Orlander, PR, MD. Hypothyroidism. Medscape. Updated: Feb 26, 2018. What is hyperthyroidism? Hyperthyroidism occurs when an overactive thyroid gland produces an excessive amount of thyroid hormones. Learn hyperthyroidism causes, symptoms, and treatment. For hypothyroidism, what were the symptoms and signs you experienced? What has been the treatment for your hypothyroidism? How does your diet affect your hypothyroidism? Did you suspect you might have hypothyroidism? Please share your story. What tests and exams led to a diagnosis of hypothyroidism? If known, what is the cause of hypothyroidism in you or a relative? What is depression? Get information on symptoms, signs, tests, and treatments for many types of depression including major depression, chronic depression, teen depression, and postpartum depression. Many people do not recognize the symptoms and warning signs of depression and depressive disorders in children and adults. With proper diagnosis, treatments and medications are available. Take this quiz to learn more about recovery from depression. ELISA stands for "enzyme-linked immunosorbent assay." This is a rapid immunochemical test that involves an enzyme (a protein that catalyzes a biochemical reaction). It also involves an antibody or antigen (immunologic molecules). Fine needle aspiration biopsy of the thyroid is used to obtain tissue for analysis. Fine needle aspiration is also performed to treat thyroid cysts. The fine needle aspiration biopsy procedure may be recommended to make the diagnosis and/or select therapy of a thyroid nodule. Fine needle aspiration biopsy may also be recommended to drain or shrink a thyroid cyst. Muscle cramps are involuntarily and forcibly contracted muscles that do not relax. Extremely common, any muscles that have voluntary control, including some organs, are subject to cramp. Since there is such variety in the types of muscle cramps that can occur, many causes and preventative medications are known. Stretching is the most common way to stop or prevent most muscle cramps. A pinched nerve causes pain, numbness, or tingling in the affected area due to pressure on a nerve. Caral tunnel and sciatica are two examples of conditions caused by a pinched nerve. A pinched nerve is diagnosed by taking a patient history and performing a physical examination. Electromyography may be performed. Treatment for a pinched nerve depends on the underlying cause. Stress creeps into everyone's life at one time or another, while some people will suffer from poorly managed chronic stress. If you're suffering, there are things you can do. Take the Stress Quiz to learn what you can do to beat the long-term effects of chronic stress. Thyroid blood tests determine the adequacy of the levels of thyroid hormones in in a patient. The blood tests can determine if the thyroid gland's hormone production is normal, overactive, or underactive. The level of thyroid hormones may help to diagnose hypothyroidism or hyperthyroidism. The test may also point to other diseases of conditions of the thyroid gland. Thyroid diseases and disorders are caused because the body either makes too much or too little thyroid hormones, which are necessary for vital functions of the body. Thyroid disease and disorder symptoms and signs depend on the type of the thyroid problem. Examples include heat or cold intolerance, sweating, weight loss or gain, palpitations, fatigue, dry skin, constipation, brittle hair, joint aches and pains, heart palpitations, edema, feeling bloated, puffiness in the face, reduced menstrual flow, changes in the frequency of bowel movements and habits, high cholesterol, hoarseness, brittle hair, difficulty swallowing, shortness of breath, a visible lump or swelling in the neck, tremors, memory problems, depression, nervousness, agitation, irritability, or poor concentration. Thyroid problems are more common in women. The thyroid peroxidase test measures the level of an antibody that is directed against thyroid peroxidase (TPO). A presence of TPOAb in the blood reflects a prior attack by the body's immune system on thyroid tissue. A positive thyroid peroxidase test may signal chronic thyroiditis. Other autoimmune disorders, however, may have a positive TPOAb test. 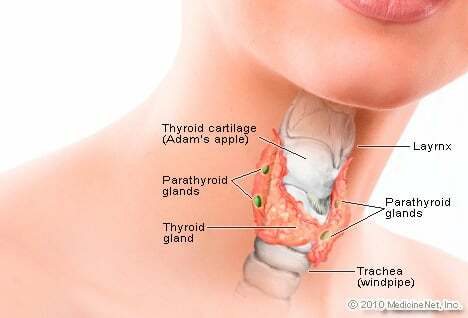 The thyroid is a butterfly-shaped gland located in the front of the neck just below the Adams apple. See a picture of the Thyroid and learn more about the health topic. Learn about thyroid problems such as hyperthyroidism, hypothyroidism, thyroid cancer, and more. Discover symptoms and treatments for various thyroid problems. Your unexplained change in weight could indicate a thyroid condition. Take the Thyroid Quiz to learn about common symptoms and treatments of overactive and underactive thyroid disorders. Thyroid scanning is used to determine how active the thyroid is in manufacturing thyroid hormone. This can determine whether inflammation of the thyroid gland (thyroiditis) is present. It can also detect the presence and degree of overactivity of the gland (hyperthyroidism) or, conversely, it can determine the presence and degree of underactivity of the gland (hypothyroidism). There are a variety of diseases and conditions that can cause tongue problems, discoloration, and soreness. Though most tongue problems are not serious. Conditions such as leukoplakia, oral thrush, and oral lichen planus may cause a white tongue while Kawasaki syndrome, scarlet fever, and geographic tongue may cause the tongue to appear red. A black hairy tongue may be caused by overgrown papillae on the tongue. Canker sores, smoking, and trauma may cause soreness of the tongue. Constipation or the decrease in frequency and/or difficulty in passing stools (bowel movements) can be caused by a variety problems. Check out these top 15 foods to avoid because they cause constipation. Some foods to avoid include, white rice and breads, caffeine, bananas, alcohol, processed foods, and frozen dinners. Foot pain and heel pain can be serious health problems. Discover information about cold feet, itchy feet, burning feet and swollen feet, along with foot pain causes and treatments for diseases like athlete's foot.